Is it just me or does the GUI look like Molekular? Last edited by telecode on Wed Jan 23, 2019 4:02 am, edited 1 time in total. but, whole genres are built on sounds from Massive. Actually I be curious to dig deeper. Which genres do you think were directly influenced by Massive and it's capabilities? Dubstep, Trance... i'm not too familiar with other EDM genres, but, i think all those Future... Tech... whatever genres also had a big use of Massive for their sounds. As far as i know, Massive and Sylenth1 are sort of the "dream duo" for many productions in those genres. As i mentioned, i never was a big fan of Massive. IMO, it IS overrated, but, the same could be said for Sylenth1. Even though i definitely rate Sylenth1 higher than Massive. I think Massive X will be a big improvement whatsoever. The 3 dark horizontal bands on the UI have a lot of knobs and stuff on them, but they are such a contrast with the white/beige sections that it doesn't look cluttered. I think the UI is really clever. It crams in heaps of functions & modulation without looking messy. the love for Sylenth1, Massive & Serum is nothing rational, many synth sound better, have more capabilities, are nicer or more efficients but those synth are the most iconic legends, what makes a legend is neither rational nor mastered. Massive X will be a big improvement but i bet it will never become a legends, just a good modern synth like ana2, icarus, pigments, dune 3, falcon..
NI does not mean anything for today producer, we have grow up with this compagnies, they didn't, in our time NI was the genesis of electronic music, today NI is a groovebox & keyboard sellers. I think Trance is more on the JP8K, Access Virus and Sylenth1 side of things. Massive isn’t hifi or punchy sounding enough for trance. Maybe it’s good for techno and acid. 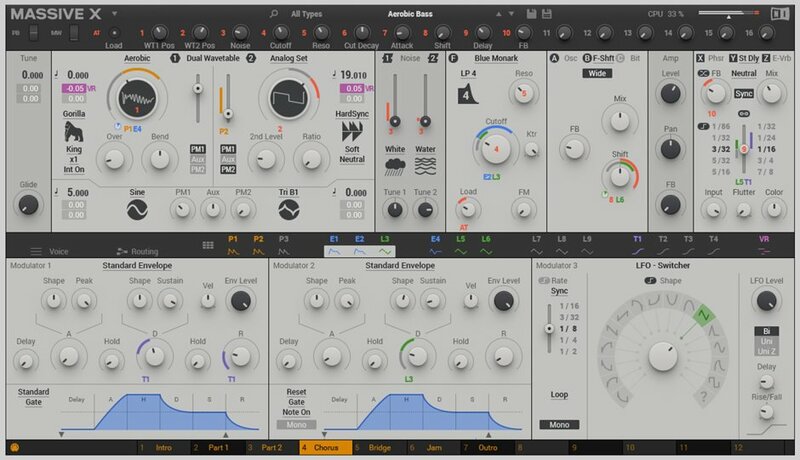 I think Massive is a very mediocre synth. It’s only successful because of the massive marketing behemoth that is NI. And the fact that sound libraries for it are cheap and numerous. Last edited by v1o on Wed Jan 23, 2019 8:03 am, edited 1 time in total. btw Massive on his own can produce dub/brostep, FM8 is better to get the inital grawl but then you have to use a external filter to wooble. Last edited by drdriller on Wed Jan 23, 2019 8:10 am, edited 3 times in total. dubstep after 2007, HO wait when was massive released ? A loud obnoxious entirely soulless genre with demonic growling synth sounds. You are quite wrong there. It’s only successful because of the massive marketing behemoth that is NI. Not really. Marketing alone didn't put Massive on any sort of pedestal so that it became that highly regarded. Users did. In any case, I would say that Leap into the void shows very well what Massive can do, while absolutely not sounding "thing" or "mediocre". Brostep is pure sexism. Someone should invent Sissystep to counteract. There literally was a sub-genre called Ladystep that emerged shortly after. It was generally more trancey, less angry and had more female vocals. But we know how upset feminists get about gender stereotypes!